I hit a mile-marker today, a personal best. 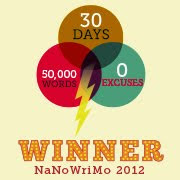 I'm up to 10,598 words on my NaNoWriMo book. What's that you NaNo savvy people say? That I was supposed to hit 10,000 yesterday. Right you are! But let me tell you something - I've never crested the 10,000 mark on any single project. So this, my friends, is worthy of a blog post. And a nice glass of wine (or two). My trusty NaNo dashboard informs me that I have to write 1,714 words a day to finish on time, and I think that's immensely do-able. Is it any good? Probably not. At least not yet. But that's what December and beyond is for, to make it good. For now, it's words. Words on a page. 10,598 words on a page, to be exact. That makes me happy. For those of you playing along, I hope you're writing like the wind. If you're writing like the wind, your probably not reading this blog post. Still, I'm rooting for you, one and all.